Kevin wanted to be a veterinary surgeon from an early age. 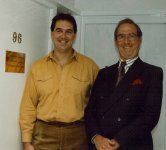 His father, Brigadier John Clifford, was Honorary Veterinary Surgeon to HM the Queen and Kevin grew up surrounded by animals. Kevin graduated from The Royal Veterinary College in London in 1984. He has worked in small animal practice in London since then and has a wealth of experience in companion animal medicine and surgery. Having always loved the Chelsea area, Kevin founded the Brompton Veterinary Clinic on the Fulham Road in 1993 and has enjoyed being involved with many families and their pets ever since. Kevin has been a member of the Kennel Club for 25 years and was Chief Veterinary Surgeon to the annual Discover Dogs show at Earls Court for seven years. In 2013, Kevin was appointed to the Animal Health Group, a panel of veterinary surgeons, which advises the Kennel Club on breed related health issues in dogs. 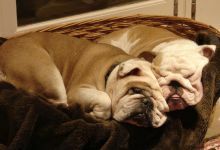 As an owner of bulldogs for many years, Kevin has a special interest in bulldog health and preventative care, with a large number of bulldogs coming to see him at the practice from all over London. 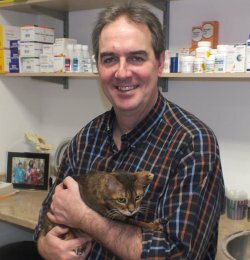 As a member of the International Society of Feline Medicine (ISFM), Kevin also has a keen interest in feline medicine and the Brompton Veterinary Clinic is a registered ISFM Cat Friendly Clinic. Kevin continues to live locally and is married to a Consultant Gynaecologist, with three children who keep them both busy. They share their home with Toffee (nee Tank) and and Humphrey (nee Oddjob) , their lovable bulldogs and Elvis, a very noisy African Grey parrot. When not at the practice, he pursues his interest in oriental textiles and is currently trying to learn Mandarin Chinese! 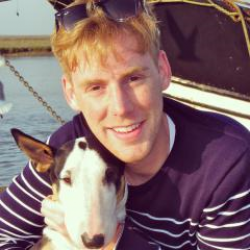 Will joined the Brompton Veterinary Clinic team in June 2014. He graduated from the Royal Veterinary College, London in 2011 and has gained experience in several practices in the UK, before settling In London. He has worked with animal charities in Tanzania, India and , most recently, with the Cat Welfare Society in Greece. Will is particularly interested in dermatology and soft tissue surgery and is looking to take advanced diplomas in these specialist areas. When not working, Will enjoys skiing, traveling and running with Perry, his English Bull Terrier. Marta joined the practice in 2013. She is from Portugal and studied veterinary nursing at a busy animal hospital in Lisbon, where she qualified as a veterinary nurse. She has now been nursing for six years and particularly enjoys emergency care and surgical nursing. She has two domestic short haired cats - Shakti and Zeus. 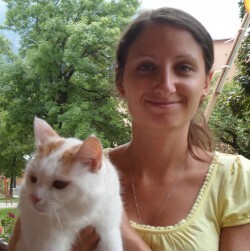 Monika joined us in January 2014 and works as a Saturday receptionist. 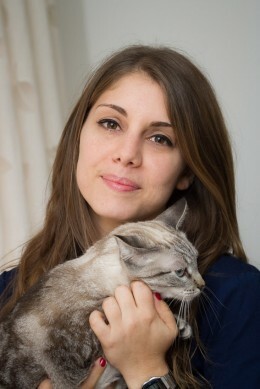 Born in Germany, Monika has a full time job in London but was keen to work with animals. 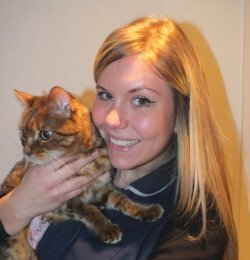 She is a cat enthusiast and so especially enjoys helping look after our boarding feline guests. 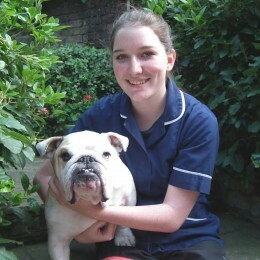 Chelsea joined the practice in 2012 having worked in London as a veterinary nurse for 8 years. She is particularly interested in surgical aspects of veterinary nursing and radiography. She is an animal lover who has 2 Griffins â€“ Lacey and Lamb - and a German Shepherd called Vinnie. For many years, Kevin's youngest daughter, Jemima, has helped out at the clinic. She loves looking after the boarding cats and has always been keen to help Kevin with weekend emergencies.